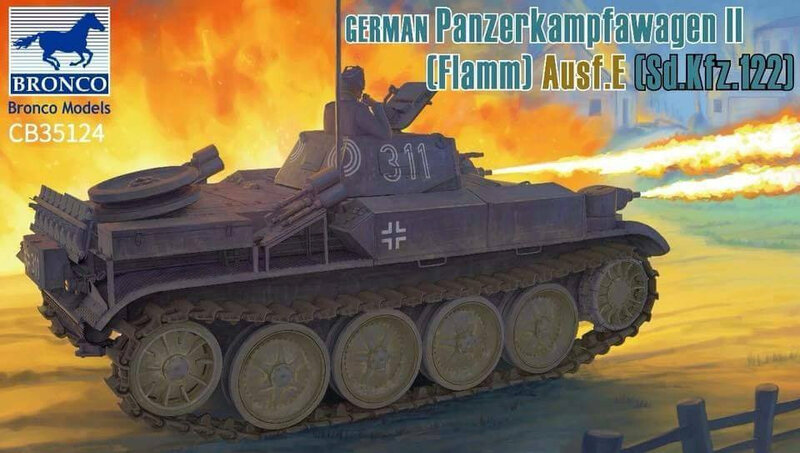 On February 21,1939 German Army HQ ordered the development of Flammpanzer (flame-thrower tank). Both producers of Panzer II, MAN (Maschinenfabrik Augsburg-Nuremberg) and Daimler-Benz were selected to develop that project. 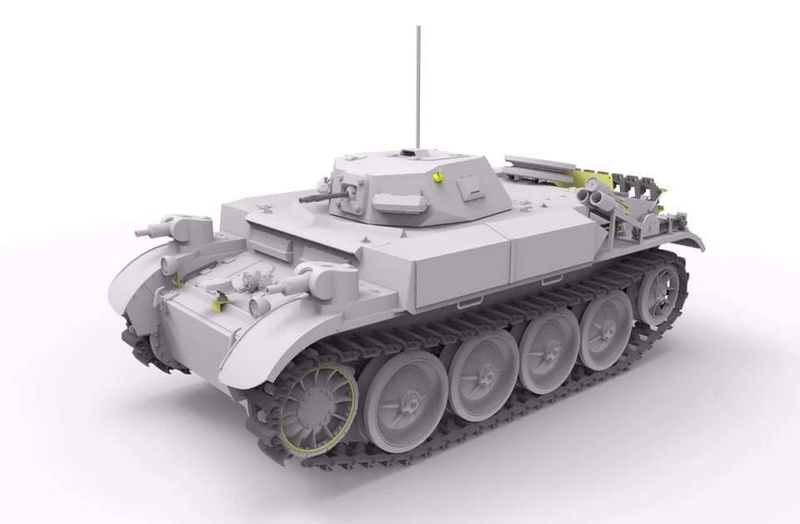 Shortly after, July of 1939, soft-steel prototype based on Panzer II Ausf D/E's chassis was built. It was armed with two flame-throwers mounted on track guards on each side. 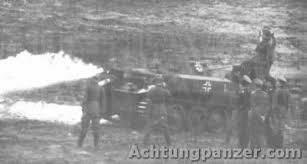 Flame-throwers were mounted in special turret-like cases (Spitzkopfe) that allowed them to operate at 180 degrees radius. Each flame-thrower had its own fuel tank with 160 litres capacity which was enough to fire 80 "shots" at the maximum range of 25 meters. Flame-throwers fuel consisted of a mixture of oil and gasoline that was "shot" with help of pressurized nitrogen stored in six pressurized tanks. Flame-thrower was ignited with acetylene "lighter". For additional armament MG34 7.92mm for which 1800 rounds were carried inside. A machine gun was mounted in a small rotating turret (Kugelblende). Its crew consisted of three men (driver, radio operator and commander/flame-thrower operator) and its armour protection ranged from 14.5mm to 30mm thickness. 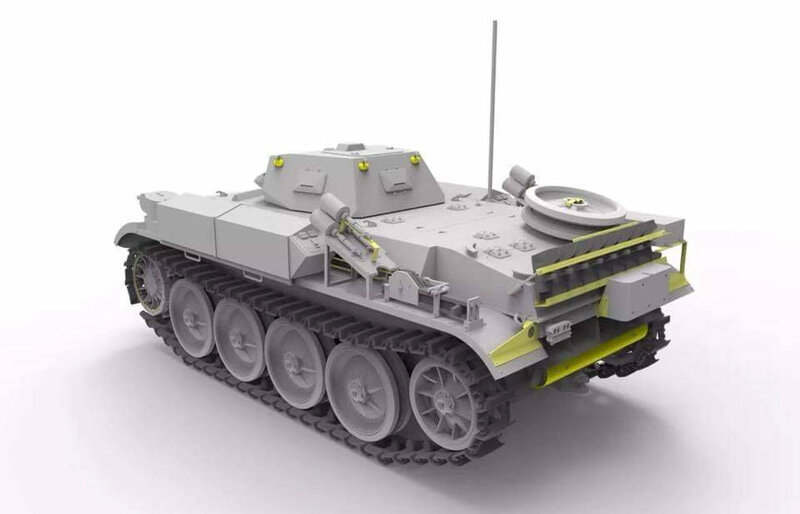 PzKpfw II (F) was powered by 6 cylinder Maybach HL62 TRM engine with total power of 140hp. From April to September of 1939, MAN produced 46 complete chassis, which were to be converted into Flammpanzers by Wegmann & Co.(Kassel). Conversion started in January of 1940. In March of 1940, another 30 PzKpfw II Ausf D/Es were taken from 7th (10) and 8th (20) Panzer Divisions and were converted to PzKpfw II(F)s. Overall, 90 PzKpfw II(F)s were produced from May to December of 1940. 87 were finished by October 1940 and other 3 were finished in February of 1941. 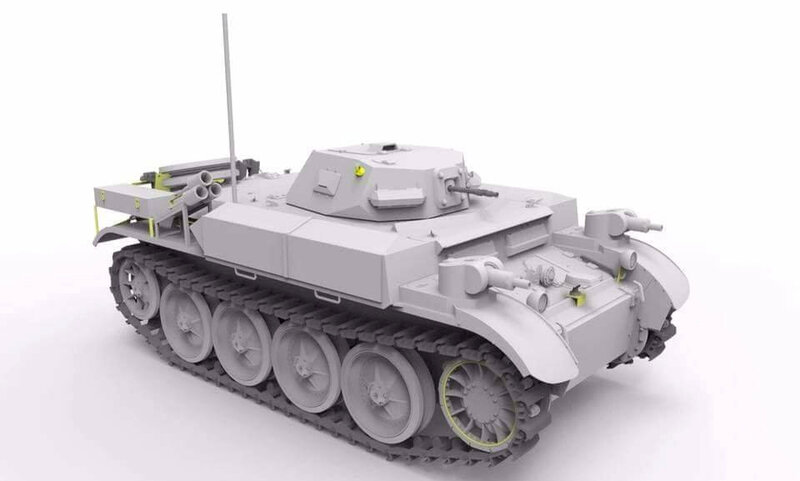 In March of 1940, new order for 150 PzKpfw II(F)s was placed but only 90 were built until August of 1941. The rest of the order was completed as regular PzKpfw II Ausf D tanks. 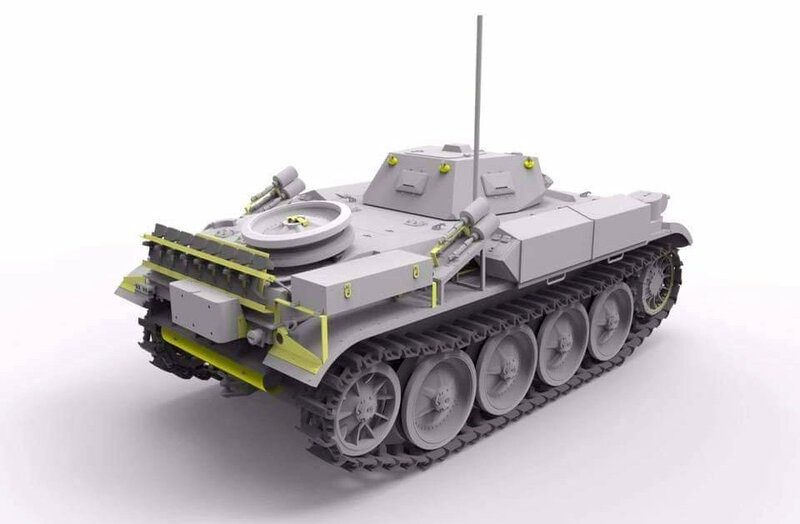 In December of 1941, it was ordered that both 90 Flammpanzers and 60 tanks were to be completed as mounts for self-propelled anti-tank guns - Marder IIs. The total number of PzKpfw II(F)s produced was 90. 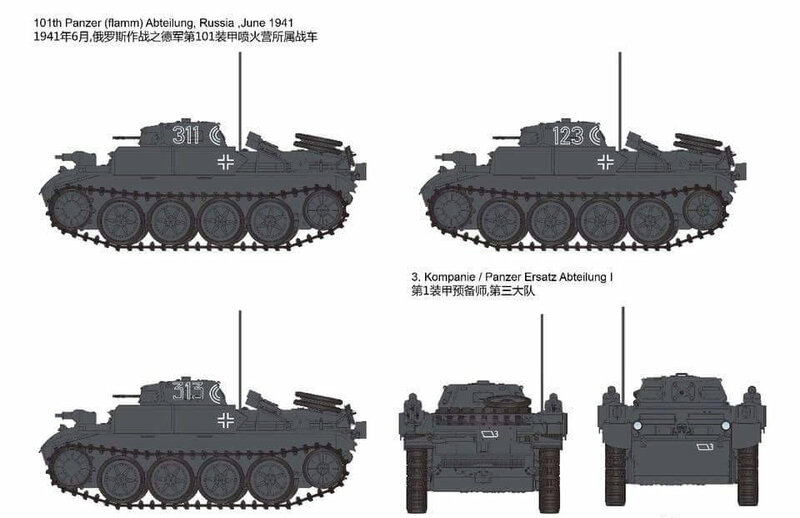 All PzKpfw II(F)s were issued to Panzerabteilung (F) 100 and Panzer Abteilung (F) 101. During Operation Barbarossa, Panzerabteilung (F) 100 was attached to 18th Panzer Division and Panzerabteilung (F) 101 was attached to the 7th Panzer Division. 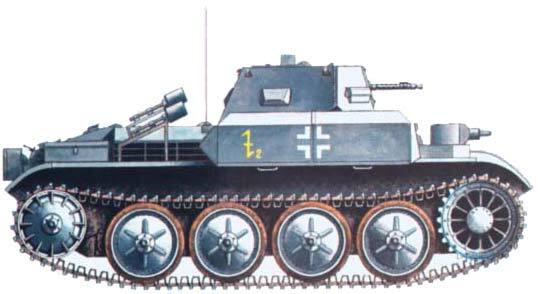 Flammpanzers saw service in Russia until late 1941, when both units were withdrawn to Germany and reorganized. 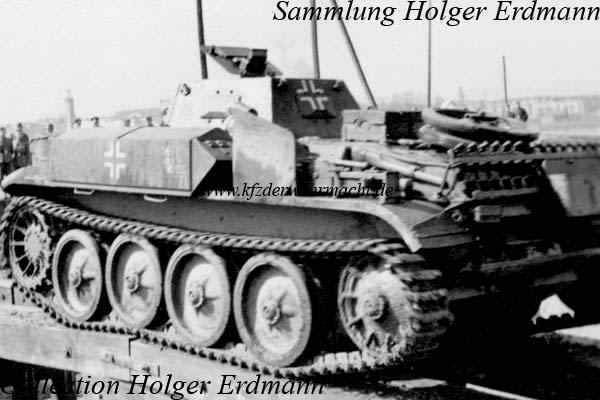 Surviving Flammpanzers were converted into Marder IIs. A number of turrets removed from converted Flammpanzer II tanks ended up as part of German fortification e.g. in Norway. PzKpfw II(F)s were used as a close combat weapon working with the support of infantry. Today, fully restored and operational Flammpanzer II can be seen in the "Wehrtechnik Museum" in Koblenz Germany. Some of the features of this kit in CAD mockups, these show Photo-Etch and features of the kit that is nearing completion. There are three schemes to go with this kit in four different markings with decals supplied of course. More on this kit as it comes to us nearer its release in August (we think). or check out the Bronco Models Website for more on their kits.